Two days ago news appeared in the media in Chhattisgarh that an Adivasi Christian minor girl was raped and brutally killed in Kondagaon district of Bastar region of Chhattisgarh. The police have been investigating the case and the victim’s family have been kept in isolation for the past 10-12 days. The family have turned to Christian faith for the past 18 years, which invited the enmity of the rest of the Adivasis in the village. For being Christian, the Adivasi panchayat in the village have imposed a social boycott on the family and neither the relatives of the extended family visit them nor they are invited to any social functions to their homes. In the recent past, there have several incidents of attack on minorities across the length and breadth of Chhattisgarh. While in some cases these were directed on the places of worship directly, in others it were a direct assault of persons who run these churches, attack on worship places, beating up believers, where sexual abuse and exploitation of children in schools have been used as a strategy against Christians. The thick forest zones of Chhattisgarh, has also become the battleground of all anti-Christian movements. Of late large sections of Adivasi population have been slowly moving to Christian faith, leaving behind the Hindu religion. In a way the eruption of communal violence against Christian faith is also an attack on the constitutional rights of Adivasis. In other words, it is an attack on the very identity of Adivasis. Over the course of time, Chhattisgarh had turned out to be the hotbed of all sorts of violent experiments against Christian population, predominantly the Adivasi Christians. In both the scenes the state had played a role that in no way could account to upholding the fundamental human rights of the local villagers. This war like situation has been challenged by many quarters of civil liberties and human rights groups. In villages like Karmari, Bade, Thegli, Sirisguda and Belar of Bastar district resolutions were passed by the Gram Sabha under Section 129 (g) of Chhattisgarh Gram Panchayat Act, 1993 (CGPA). This wrongly invoked the spirit of the Article 15 (1) and (2) of the Constitution, where the State under no ground could discriminate any citizen on religious ground and that religion cannot be the base leading to any sort of restrictions and conditions. The resolution violated this spirit by restricting non-Hindus in these villages from residing or building worship places and conducting worships in accordance with their faith. Article 25 of the Constitution guarantees the freedom of religion to all citizens of India and most of these have overridden the constitutional norms. Though the resolution of Karmari and Sirisguda panchayats was challenged in Bilaspur High Court, which quashed the resolution, such extremely communal resolution under the guidance of Hindu right wing groups remains a serious concern to the larger fabric of democratic India. On April 17 this year, Pastor Dinbanhu Sameli (30) and his wife Meena (26) were assaulted and their church set on fire after they refused to praise Ram and stamp on a Bible. The incident took place in Karanji village of Tokapal panchayat. Meena was seven months pregnant, who shouldered her husband in leading the church activities. According to Pastor Sameli, two young men, allegedly from Bajrang Dal approached him and his wife initially under cover, who immediately raised their hood by holding a sword to the his neck demanding to shout ‘Jai Shri Ram’ and stamp on the Bible. Soon a group of young men surface the place. When the couple refused to do either of the acts, the men vandalised the church and brought a litre of petrol on Holy Bible, furniture, musical instruments and other religious material and set fire on the things inside the church. The goons beat both Sameli and Meena followed by pouring of petrol over them and were about to set them ablaze when the couple ran for life and somehow escaped. They were armed with sword, knife, hammer and sticks. Interestingly the local media, as often in incidences with Christians, took a diametrically opposite turn by blaming the pastor of indulged in conversion. In recent years disallowance of construction of churches is a normal happening in the villages across Bastar. 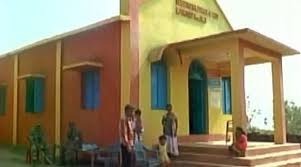 In Bhadhisgaon of Tokapal Panchayat in Bastar district, under section 55 (1) and (2) of CGPA Pastor Pilaram Kawde was served a written notice by the Gram Panchayat denying permission to construct a Church on his private land. The written notice reads ‘people of big-big castes and religions live in this village, and every Dussehra even the Roopshila Devi Ma joins the celebrations’, reported the team. Christian believers are prevented from using burial grounds in several villages. In Bhadisgaon, an elderly Christian believer woman Saradi Bai died on May 25 this year. The villagers prevented the relatives from burying her body mentioning it is against the Hindu custom. In Bhadisgaon, an elderly Christian lady Saradi Bai died on May 25, 2016. The Hindu villagers provoked by the Bajrang Dal stopped Christians from burying her. Eventually, after negotiations conducted by the police, she was buried in a casket but without the cross. The Hindu villagers warned that in future no Christian burial would be allowed. Later some 200 Christians of the village gave applications to the SDM, Tehsildar, police and Sarpanch asking that burial grounds be allotted separately for Christians, since they were being prevented from using the common burial grounds. Saradi Bai’s husband Sukhdev Netam died on June 6, 2016. The Hindu villagers prevented Christians from carrying out his final rites of burial. They threatened to kill if the Christians tried to bury the body. Eventually after police arrival, he was buried. Again, the villagers and Sarpanch warned that in future, they would call Bajrang Dal if there were any attempt by Christians in the village to use the burial grounds. In Sirisguda village, rations were denied to Christian believers. The Sarpanch seized their cards. This has been going on for a couple of years now. When complained a team from the department of civil supplies went to investigate the matter. The authorities were beaten up along with the believers with serious injuries. The ambulance called to take them to hospital was not allowed to enter the village. Injured Christians were not allowed to get proper treatment in the district hospital. The police refused to file the First Information Report (FIR). After great efforts a case was registered but the statements of the injured are yet to be taken in Court. Members of Vishwa Hindu Parishad (VHP) and Bajrang Dal in the village prevent Christians from filling water from the hand pumps. Again this issue was complained with the District Collector. The collector convened a meeting of both the parties. In the meeting, members of the VHP and Bajrang Dal said that Christians must perform a ghar wapsi (return to home) ritual, or else they would be thrown out of the village invoking Section 129 (g) of the Panchayat Act. Violence against Christians could be observed across the state. The situation has not changed even after the High Court intervention. 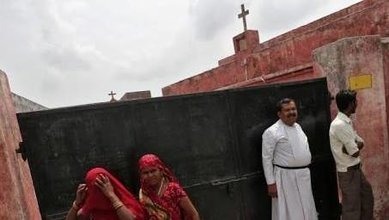 A report by Christian group that monitors persecution says, between January and April 2016, 49 incidences of violence against Christians have surfaced in Chhattisgarh alone. The same period also saw 116 incidences of violence against Christians in central India. Such extends of violence includes torture of women, beating of pastors, beating of believers, intimidation of worshippers, social and cultural boycott by dominant religious groups, destruction of property, demolition of places of worship, invoking unconstitutional norms under different Acts, disallowing lifecycle rites and rituals of birth, marriage and death as well as threatening children. There are several other incidences in other parts of the State. On June 19, 2015, a Catholic nun was gang-raped in the capital of Raipur by unidentified men, while she was on her duty in the medical centre run by the convent. Between September 10-13, 2015 a Catholic school and the adjacent Church was met with a series of attacked in Sarbhoka village of Chirimiri area of Korea district under the aegis of sexual abuse of a girl student after which the principal of the school (a priest), a nun and hostel help were arrested. In Chirimiri soon after the incident of Sarbhoka, Bersheba church was vandalised along with the beating of pastor and churchgoers. The Jacobite church close-by in Chirimiri was also damaged. 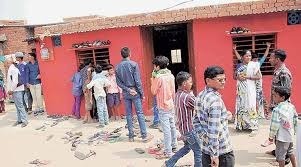 In March 2016 year a prayer home in Kachna area of Raipur was attacked by members of Bajrang Dal while the pastor was conducting the Sunday worship. Recently on June 5, 2016, at Ara village of Bario Chowki, Jeypore police station of Balrampur district, on, 5 June 2016, a Bajrang Dal mob of 25 people led by Chhotu Jaiswal, Sonu Gupta, Bipin Gupta, Chhotu Gupta and others attacked the church during the Sunday prayers. 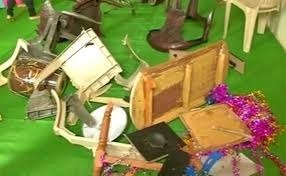 They went on to vandalise the church, beat up the pastor, his wife and three others. They made a video of the thrashing and made it viral. They dragged off the pastor, his wife and three others to the Bario Chowki where they were kept till night. No FIR was registered against the assailants – instead a case under section 295A of Indian Penal Code (IPC) has been registered against the pastor. According to the section the pastor had committed deliberate and malicious acts, intended to outrage religious feelings or any class by insulting its religion or religious beliefs. These attacks on the Adivasi Christians cannot be understood in isolation. It has a certain well-defined patterns. In most of the cases of violent attacks on Churches, religious institutions or places of worship, the administration claims they are unable to make arrests, even when every person in the vicinity knows the whole story of who all are involved. In cases where the complainant has categorically named the individuals, who are mostly leaders of Rashtriya Swayamsewak Sangh (RSS) or one of it’s many outfits, there is no action against them. This certainly disturbs the idea that police and administration are impartial and uphold the constitutional validity of coexistence and plurality. Ironically, in each instance, speaking in defence of the inaction of the administration, the politicians – invariably from the ruling BJP – say it was the work of an ‘angered mob’. Such mobs have no face. This seems like a convenient way to place the blame on ordinary people, while such attacks of vandalism are not only religious but also socially and politically orchestrated by several outfits of RSS. Mind it, in almost all the cases in Bastar region, the pastors of the churches, the churchgoers and the local of these churches were essentially ‘Adivasis’. Hence, the attack on these institutions are not simply an attack on Christian faith, it is essentially an attack on the ethnic identity of the Adivasi population too. While at one end churches and institutions are attacked mostly under the aegis of ‘forced conversion’ the perpetrators of such horrendous criminal act are easily left under the pretext of mob violence. Generally the police deny taking complaints from the victims. Even if the complaint is registered, they try to convince the courts and general public that the mob does not have any defined face. Thus police and administration thoroughly provide protection to the criminal elements. Instead of raising questions of delivering justice, the judges in the courts believe this version of the police and deliver judgments. Another trend is that the police threatens the victims in most of the cases and force them to accept that they are engaged in ‘forced conversion’ by allurement, offering money or things. Many pastors and believers are forced into jail under this acquisition. It would not be out of place to make a point that there is no conversion happening among the Adivasis. However dumping all the cases as forced conversion needs to be contested. Church based institutions like schools have been attacked invariably by invoking sections of Protection of Children from Sexual Offences (POCSO) Act to vandalise, beat and entangle the leaders in fake cases. Similarly section 129 (g) of the Chhattisgarh Panchayat Raj Act 1993 is often used against the Christian believer in rural areas. Abuse of powers under legal frameworks is seen quite high by the application of these two Acts. This in a way or other strengthens the case of non-Christian population while the police and administration uses it as their key shield. These untold stories of interference into religious freedom of citizens create a grim state in the entire state with a specific focus on Adivasi regions. This year India is going to face the universal periodic review on the status of minorities and it would be interesting how these instances would be placed before the United Nations.